In a large skillet, heat olive oil over medium-high heat. I just sprayed a pan with non stick spray and added in a splash of water when the onions or carrots stuck to the pan a bit. 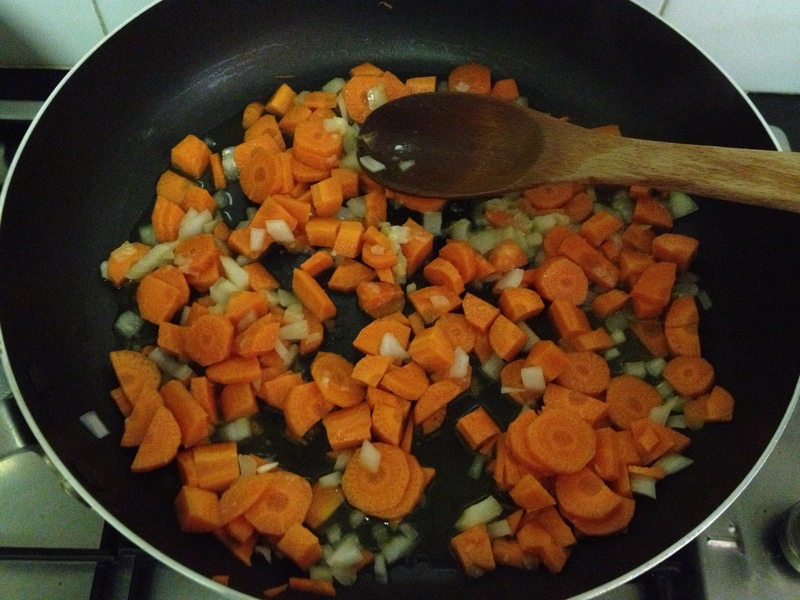 Saute the onion, garlic, ginger, and carrots (and pepper flakes if using) for at least 4-5 minutes. 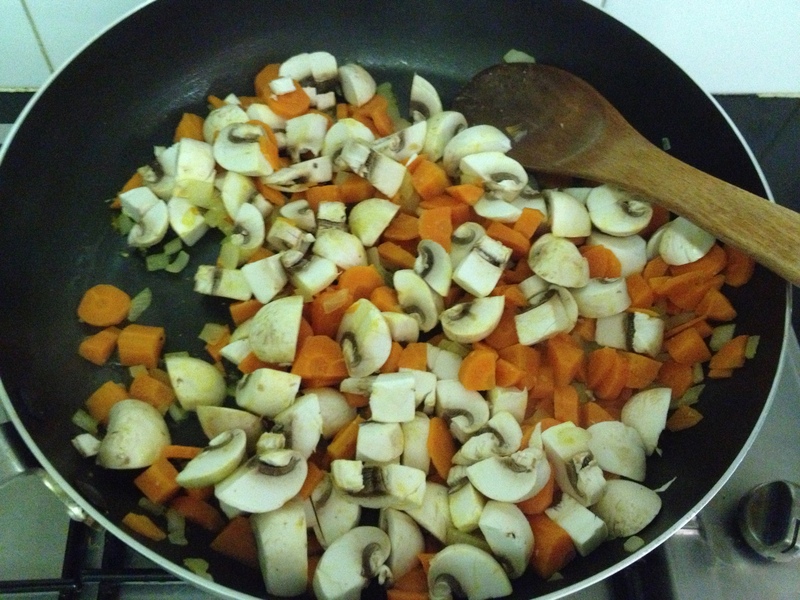 Then add your mushrooms and a splash of soy sauce. A minute or two later, add the kale and stir it all up – it will wilt after about 2 minutes. 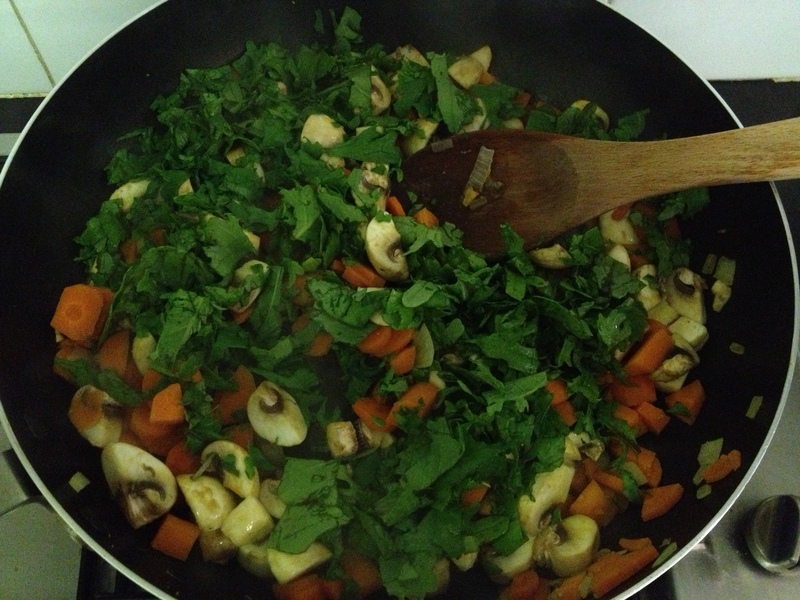 If the vegetables stick at any point, just add a splash of water and stir around continuously. 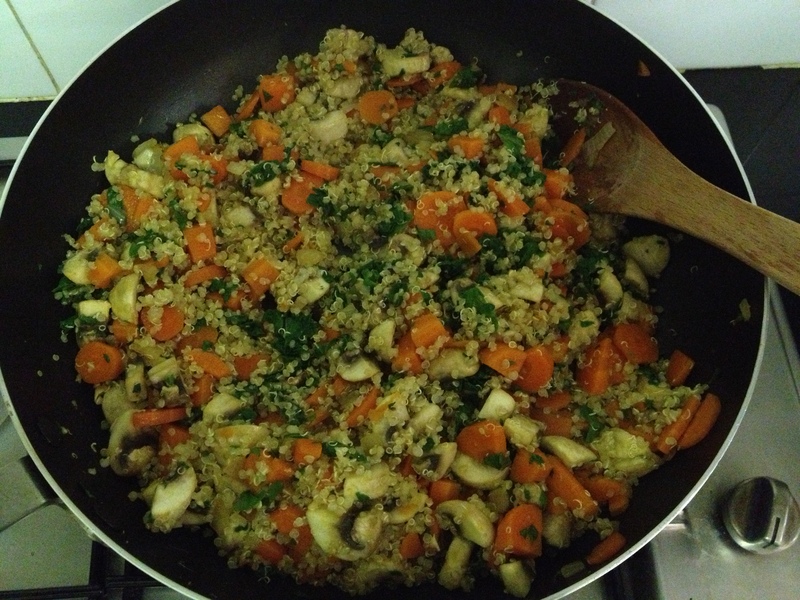 When the vegetables are softened, add quinoa, stir, and let sit 1 minute to brown a bit. Stir and let sit again, 1 more minute. When the quinoa is warmed through and crisped on some spots, make a well in the middle of the pan and crack the egg into it (this is so fun). 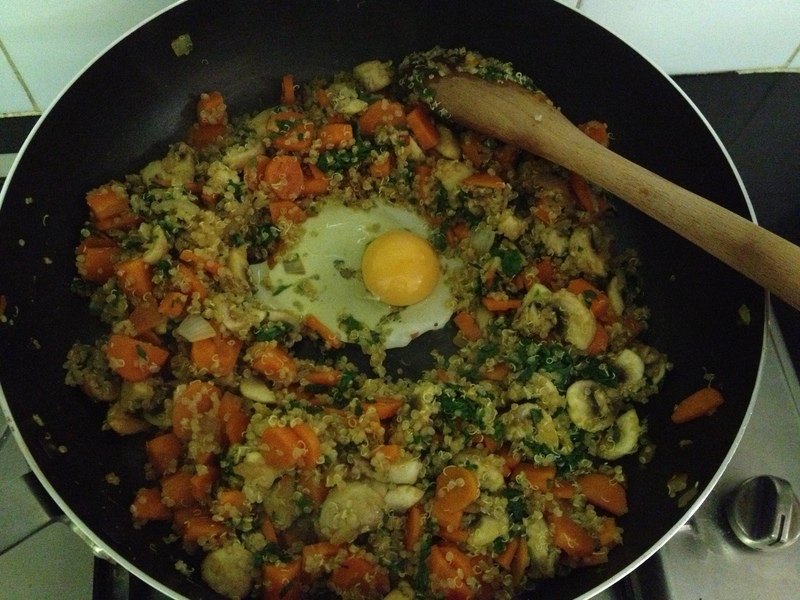 Scramble the egg in the well and then mix into the quinoa (about 30 seconds.) Add in the soy sauce and stir it all up, and then remove from the heat. This tastes best when served immediately, but I thought it also tasted great re-heated in the microwave for the next few days. I think I liked this even better than the typical veggie “fried” rice I make with brown rice. 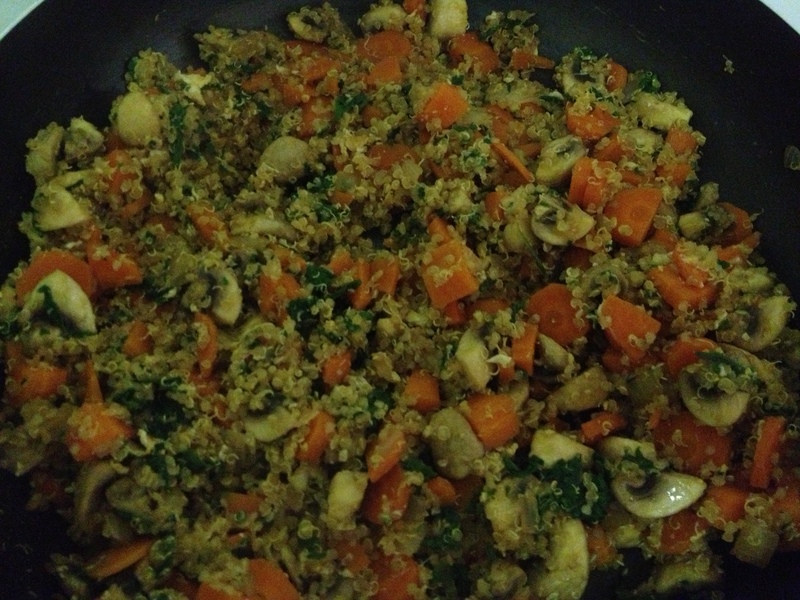 The quinoa holds up really well in this mix and I love using kale instead of something like spinach because it doesn’t wilt the same way spinach does and it really holds its flavour well. This is a great recipe to have for dinner on a Sunday and then a few lunches throughout the week. It’s like having Asian takeout food but with probably 1/10th of the calories and fat! Hey! That looks yummy! Adding mushrooms sounds delicious.